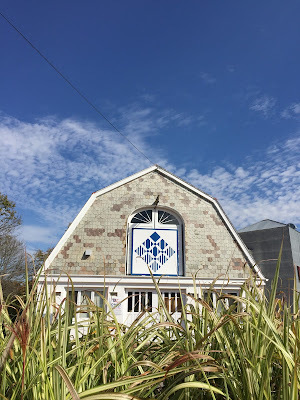 My friend and I went to The Dairy Barn in Athens, Ohio to see a contemporary quilt show entitled, "Mastery - Sustaining Momentum". It was a trip that I had wanted to take for a long time, but never quite got to Ohio. Since we were already there to take a class from Nancy Crow, we made the drive down. The Dairy Barn is an old converted Barn near the college campus in Athens. It has been the location for Quilt National since 1979. It is the premier location for contemporary quilt exhibits. This show was curated by Nancy Crow and includes 3 large works by each artist. One of our local friends was invited to participate in the show, so we had an extra special reason to catch the exhibit while we were there. No pictures are allowed in the exhibit, so I can't post any to show you, but there are YouTube videos of all of the quilters explaining their process and showing their quilts. Get over there and have a look. Just search on "Mastery Sustaining Momentum The Dairy Barn" or try this link Mastery Sustaining Momentum and they should all come up. So here is a picture of The Dairy Barn from outside. Lovely, don't you think? How fun to get to see Bonnie's quilt at that venue!